Sugathakumari (born 22 January 1934) is an Indian poet and activist, who has been at the forefront of environmental and feminist movements in Kerala, South India. Her parents were the poet and freedom fighter Bodheswaran and V. K. Karthiyayini, a Sanskrit scholar. She is influenced by her poet father's social activism and nationalistic fervour. She is the founder secretary of the Prakrithi Samrakshana Samithi, an organisation for the protection of nature and of Abhaya, a home for destitute women and a day-care centre for the mentally ill. She was the former chairperson of the Kerala State Women's Commission. She played a big role in the Save Silent Valley protest. Sugathakumari has won numerous awards and recognitions including Kerala Sahitya Akademi Award (1968), Kendra Sahitya Akademi Award (1978), Odakkuzhal Award (1982), Vayalar Award (1984), Indira Priyadarshini Vriksha Mitra Award (1986), Asan Prize (1991), Vallathol Award (2003), Kerala Sahithya Akademi Fellowship (2004), Ezhuthachan Puraskaram (2009) and Saraswati Samman (2012). In 2006, she was honoured with Padma Shri, the country's fourth highest civilian honour. Sugathakumari was born in Aranmula on 3 January 1934 in the Vazhuvelil Tharavadu. Her dad, Bodheswaran, was a famous Gandhian thinker and writer, involved in the country's freedom struggle. V. K. Karthiyayini, her mother, was a well known scholar and teacher of Sanskrit. After completing her graduation from the University College, Thiruvananthapuram, she took a master's degree in Philosophy in 1955, and did research for three years on 'Comparative Study of the Concept of Moksha in Indian Schools of Philosophy', but did not complete the thesis. Sugathakumari's husband Dr. K. Velayudhan Nair (1929–2003) was an educationist and writer. An expert in educational psychology, Nair has to his credit several works, including a widely acclaimed study on Sri Aurobindo's philosophy. They have a daughter, Lakshmi. Sugathakumari's elder sister Hridayakumari was a literary critic, orator and educationist. Hridayakumari won the Kerala Sahitya Akademi Award for 1991 for her book Kalpanikatha, a study on romanticism in Malayalam literature. Sugathakumari's first poem which she published under a pseudonym in a weekly journal in 1957 attracted wide attention. In 1968, Sugathakumari won the Kerala Sahithya Akademi for her work Pathirappookal (Flowers of Midnight). 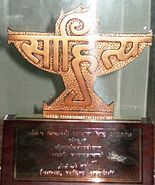 Raathrimazha (Night Rain) won the Kendra Sahitya Academy Award in 1978. Her other collections include Paavam Manavahridayam, Muthuchippi, Irulchirakukal and Swapnabhoomi. Sugathakumari's earlier poetry mostly dealt with the tragic quest for love and is considered more lyrical compared to her later works in which the quiet, lyrical sensibility is replaced by increasingly feminist responses to social disorder and injustice. Environmental issues and other contemporary problems are also sharply portrayed in her poetry. Sugathakumari is perhaps the most sensitive and most philosophical of contemporary Malayalam poets. Her poetry has always drawn upon her sadness and unhappiness. "I have been inspired to write mostly through my emotional upheavals; few of my poems can be called joyous. But these days I feel I'm slowly walking away from it all, to a world that is futile or meaningless," says Sugathakumari. Sugathakumari's most famous works include Raathrimazha, Ambalamani(temple bell) and Manalezhuthu. Sugathakumari has also made contribution to the field of children's literature. In 2008, she received an Award for Lifetime Contribution to Children's Literature, instituted by the State Institute of Children's Literature. She also has several translated works to her credit. She has won numerous other awards for her literary works, including the prestigious Vayalar Award and Ezhuthachan Puraskaram, the highest literary honour by Government of Kerala. In 2004, she was given the Kerala Sahithya Akademi Fellowship. She won the prestigious Saraswati Samman in 2012, being only the third Malayalam writer to do so. She also won "Pandit Karuppan Award. She was the principal of Kerala State Jawahar Balabhavan, Thiruvananthapuram. She is the founder chief editor of Thaliru, a children's magazine published by Kerala State Institute of Children's Literature. A committed conservationist, Sugathakumari served as the secretary of the Society for Conservation of Nature, Thiruvananthapuram. In the late 1970s she led a successful nationwide movement, known as Save Silent Valley, to save some of the oldest natural forests in the country, the Silent Valley in Kerala, from submersion as a result of a planned hydroelectric project. Her poem "Marathinu Stuthi" (Ode to a Tree) became a symbol for the protest from the intellectual community and was the opening song of most of the Save Silent Valley campaign meetings. She was the founder secretary of the Prakrithi Samrakshana Samithi, an organisation for the protection of nature. She was also actively involved with various women's movements of the seventies and served as the chairperson of the Kerala State Women's Commission. Although she is best known as a poet environmentalist, Kumari is also the founder of Abhaya (refuge) – an organisation which gives shelter and hope to female mental patients. Her work to launch Abhaya was prompted by an off-chance visit to the government-run Mental Hospital in the capital, Thiruvananthapuram. There women were housed in 19th century conditions, sexually abused and regularly prostituted to men in the neighbouring police camp. When she visited the hospital she saw 'women's bodies covered with sores and stark naked. They were emaciated and their hair was matted. They didn't even look like human beings.' The horror of this experience was embedded in her mind and she decided on the spot to do something about it, despite opposition to interventions from ngos by professionals in the field. Sugatha Kumari has received the Bhattia Award for Social Science, the Sacred Soul International Award, the Lakshmi Award for social service and the first Indira Priyadarshini Vriksha Mitra Award from the Government of India for her efforts in environmental conservation and afforestation. ^ a b "Status of women declining: Sugathakumari". The Hindu. Thiruvananthapuram, India. 3 November 2000. Retrieved 27 May 2013. ^ Tharu, Susie J.; Lalita, Ke, eds. (1993). Women Writing in India: The twentieth century. Women Writing in India: 600 B.C. to the Present. 2. Feminist Press. p. 399. ISBN 978-1-55861-029-3. Retrieved 11 October 2011. ^ a b c "Saraswati Samman for Sugathakumari". Kerala Kaumudi. Kaumudiglobal.com. 18 March 2013. Retrieved 27 May 2013. ^ "Educationist Velayudhan Nair dead". The Times of India. Indiatimes.com. 22 September 2013. Retrieved 27 May 2013. ^ a b c Mohan Lal (ed.). Encyclopaedia of Indian Literature: sasay to zorgot, Volume 5. Sahitya Akademi. pp. 4211, 4212. ^ a b "A pleasant surprise". The Hindu. Thiruvananthapuram, India. 27 January 2006. Archived from the original on 6 September 2006. Retrieved 27 May 2013. ^ a b "Award for Sugathakumari". The Hindu. Thiruvananthapuram, India. 23 April 2008. Retrieved 27 May 2013. ^ a b "Ezhuthachan Puraskaram for Sugathakumari". The Hindu. 14 November 2009. Retrieved 27 May 2013. ^ a b "Award for Sugathakumari". The Hindu. Trichur, India. 13 March 2004. Retrieved 27 May 2013. ^ a b "Antony to present Akademi Fellowship". The Hindu. Trichur, India. 10 August 2004. Retrieved 27 May 2013. ^ Sridevi Mohan (24 April 2004). "Bio-reserve nonpareil". The Hindu. Retrieved 5 May 2014. ^ Sugathakumari (1961). Muthuchippi. Mathrubhumi Books. p. 104. ISBN 9788182667174. ^ "Sugathakumari: The Artist of Poetic Skills and a Classic Example of Feminism Activist". Be An Inspirer. 3 January 2018. Retrieved 23 January 2019. ^ Sugathakumari (1968). Pavam Manava Hrudayam (in Malayalam). Poorna Publications. ^ Kumari, Sugatha (1969). Pranamam (in Malayalam). Kerala Gandhi Smarakanidhi. ^ Sugathakumari (1969). Irul chirakukal (in Malayalam). ^ Sugathakumari (1977). Raathrimazha. DC Books. ^ Sugathakumari (1981). Ambalamani. National Book Stall. p. 200. ASIN B01MSHM39L. ^ Sugathakumari (1988). Kurinjipookal (in Malayalam). DC Books. ^ "DC Books-Online BookStore". onlinestore.dcbooks.com. 23 January 2019. Retrieved 23 January 2019. ^ Sugatakumāri (1995). Rādhayevitde?. Kottayam: ḌC Books. ISBN 8171304540. OCLC 33357448. ^ Sugatakumāri (1998). Dēvadāsi. Kottayam: Ḍi. Si. Buks. ISBN 8171308007. OCLC 42737193. ^ Raju, Anupama (1 February 2018). "An evergreen voice in verse". The Hindu. Retrieved 23 January 2019. ^ Sugathakumari (2006). Sugathakumariyude Kavithakal (in Malayalam). DC Books. ^ Sugathakumari (2008). Krishnakavithakal (in Malayalam). DC Books. ^ 1934-, Sugathakumari (2010). Megham Vannu Thottappol. Kottayam: DC Books. ISBN 9788126426065. OCLC 607660686. ^ Sugathakumari. Poovazhi Maruvazhi. DC Books. p. 74. ASIN B077P56ZP6. ^ Sugathakumari. Kaadinu Kaaval. DC Books. ^ "Kerala Sahithya Akademi Winners for Poetry (1959–2003)". Kerala Sahithya Akademi. Retrieved 27 May 2013. ^ "Award for Sugathakumari". The Hindu. Kochi, India. 5 July 2009. Retrieved 27 May 2013. ^ "Basheer award presented". The Hindu. Kochi, India. 10 December 2009. Retrieved 27 May 2013. ^ "Recipients Since 1995". www.pravasidoha.org. 23 January 2019. Retrieved 23 January 2019. ^ "Saraswati Samman for Sugathakumari". The Hindu. New Delhi, India. Press Trust of India. Retrieved 19 March 2013. ^ a b "പി.കെ.വി പുരസ്‌ക്കാരം സുഗതകുമാരിയ്ക്ക്" [PKV Award to Sugathakumari] (in Malayalam). DC Books. 3 April 2013. Retrieved 27 May 2013. ^ "സുഗതകുമാരിക്ക് പണ്ഡിറ്റ് കറുപ്പന്‍ പുരസ്‌കാരം" [Pandit Karuppan to Sugathakumari] (in Malayalam). DC Books. 21 May 2013. Retrieved 27 May 2013. ^ "VT literary award presented". The Hindu. 17 September 2014. Retrieved 24 October 2014. ^ "Mathrubhumi award for Sugathakumari". The Hindu. 2 October 2014. Retrieved 2 October 2014. ^ "തോപ്പില്‍ ഭാസി പുരസ്‌കാരം സുഗതകുമാരിക്ക്". DC Books. Retrieved 2 January 2015. ^ "Award for Sugathakumari". The Hindu. Kochi, India. 26 September 2006. Retrieved 27 May 2013. ^ "Award presented to Sugathakumari". The Hindu. Kochi, India. 2 June 2007. Retrieved 27 May 2013. ^ "Award for Sugathakumari". The Hindu. Kozhikode, India. 6 December 2007. Retrieved 27 May 2013. ^ "Award for Sugathakumari". The Hindu. Alappuzha, India. 17 August 2009. Retrieved 27 May 2013. Wikimedia Commons has media related to Sugathakumari. M. Leelavathi (1980). Malayala kavita sahitya charitram (in Malayalam). Trichur: Kerala Sahitya Akademi. T. M. Chummar (1973). Padya sahitya charitram (in Malayalam). Kottayam. Mohan Lal (ed.). Encyclopaedia of Indian Literature: sasay to zorgot. 5. New Delhi: Sahitya Akademi. pp. 4111, 4112. K. V. Surendran (ed.). "5. Indian Women Poets: Mapping out New Terrains and 8. Man-Woman Relationship in Kamala Das and Sugathakumari". Indian English Poetry: New Perspectives. 5. New Delhi: Sarup & Sons. pp. 37–50, 62–70. Susie Tharu, K. Lalita, ed. (1993). Women Writing in India: The Twentieth century. 2. Feminist Press. pp. 398–401. "Sugathakumari". Kerala Tourism. 23 January 2019. Retrieved 23 January 2019.